Home » miscellaneous » Why Should We Consider Recycling The E-Waste? Electronic Waste or the e-waste is just similar to any other type of waste that is created by the mankind and is capable of destroying the whole world itself unless it is treated correctly. E-waste is growing far beyond and gaining more attention that is causing harm to the environment and living beings which isn’t much noticed at present. People who are the only reason behind the e-waste which is not much aware of the things caused and that is to happen. Everyday new technology is introduced replacing the present making it pretty unusable, despite it is the primary reason for the e-wastes. There are people now looking for solutions to minimize the e-wastes and the recycling the electronic devices without any chances of information theft. That is a great move towards reducing the amount of wastage of gadgets which isn’t usable anymore and is secured from not to be a threat to the humanity. The society is highly influenced by the electronics in one or the other way almost every person has bonded to one or more electronic product. The products are becoming much cheaper, end of the life of them has also become unpredictable in this world with the explosive growth of electronics is occurring. The reports of using, making, selling or dumping the electronic products are now found to be devastatingly increasing beyond the records. 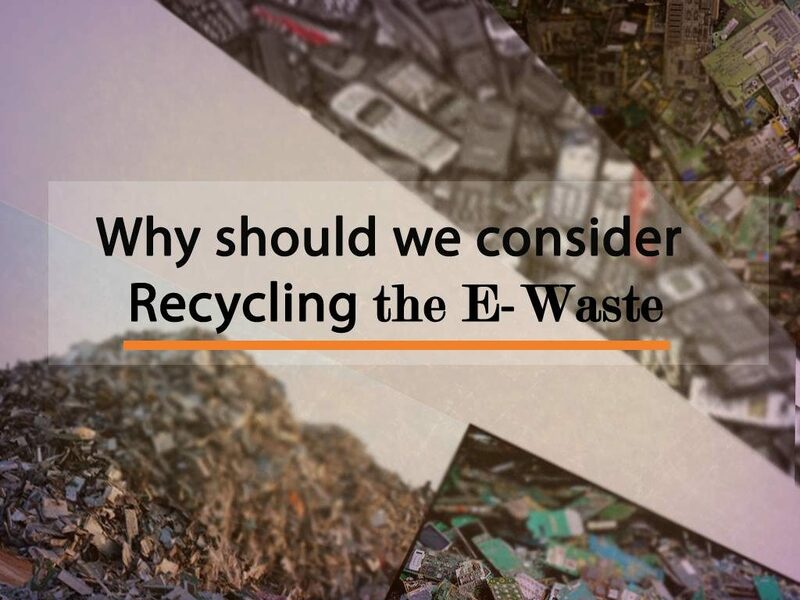 So, I’m compiling this new article with social commitment and responsibility that every human being should be involved in controlling the rapid growth of harmful e-wastes with the determination that our environment should become e-waste less. The E-waste or Electronic Wastes is basically described to as the discarded electronic or electrical devices that include the microphones, radios, mp3 players, televisions, different computer parts, and mobile phones. Despite the major amount of these items are being reused or often recycled, due to high productivity there is a significant amount of them that is being dumped. As per the U.S. EPA data 2014, only 41.7 percent of Selected Consumer Electronics is included in the graph of the Recycling and Composting Rates of Selected Products which include products such as TVs, DVD players, stereos, VCRs, video cameras, telephones, smartphones and the computer equipment. There are billions and billions of electronics products that are being reportedly included in the sale records of the Global Sale Reports. Why is Recycling E-Waste Required? The major reason we all think for the E-waste recycling will be it is because of our concern towards nature; yes it is a good reason to rely on, but still, there is some more which is equally important. Other than this there is some more relevant reasons for the e-waste disposal. The electronic items manufactured using plastic and other non-degradable materials contains the toxic substances like the lead, mercury, cadmium, and chromium that requires heavy processing before releasing into the environment. Once the recycling of e-waste is implemented on a great scale, the place and area used for dumping the waste materials could be conserved and the environment or the ecosystem affected also will be saved from the consequences caused, and obviously, the land will be used for all other manly needs. The e-wastes could be employed as the raw materials for making new electronics; the 10-15 percent of the gold can be successfully and profitably recovered from the e-wastes. The United Nations has been found out that the total e-wastes will have 40 and 50 times richer precious metal deposits than the ores that have mined from the earth. In evidently these facts and figures shows the human beings the importance of the E-waste recycling. The International Movement of Hazardous Waste had happened as the movement of e-wastes to the countries where the cheap labor and under civilized way of recycling the electronic wastes has made the human community to cause ill and toxins contained within the electronic materials has been resulted in massive health problems. The electronic devices will have the components like Glass, Printed-Circuit-Boards, Batteries, Plastic and Metals which could be available for reuse to make new materials or can be used further by recycling. The batteries found from the electronic wastes could be made out for reusing with good efficiency without been destroyed and disposed to cause any ill effects, the metal components of the battery like nickel, steel, cadmium and cobalt can be recovered and could be reused to make a new battery. Since the E-waste is a global problem, people should take their own stand towards the increasing problems caused by the explosion in manufacturing the electronic goods for our own safety and security. The efficient management of the electronic waste can easily affect nature to keep the environment in a better manner, for that the recycling of the e-waste is far better way.